After some time ago Lamborghini launched the one-off racing-purposed supercar called the Lamborghini Squadra Corse SC18, and it seems Ferrari also did not want to miss. Recently the Maranello-based premium car manufacturer launched their latest creation, named Ferrari SP3JC. 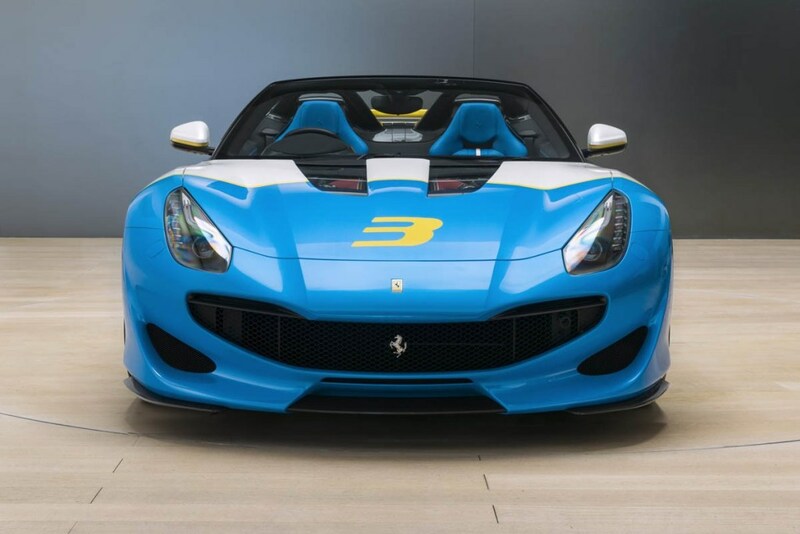 The SP3JC is the latest one-off project from Ferrari which has been officially handed over to its owner namely John Collins, a Scottish collector and former freelance writer. 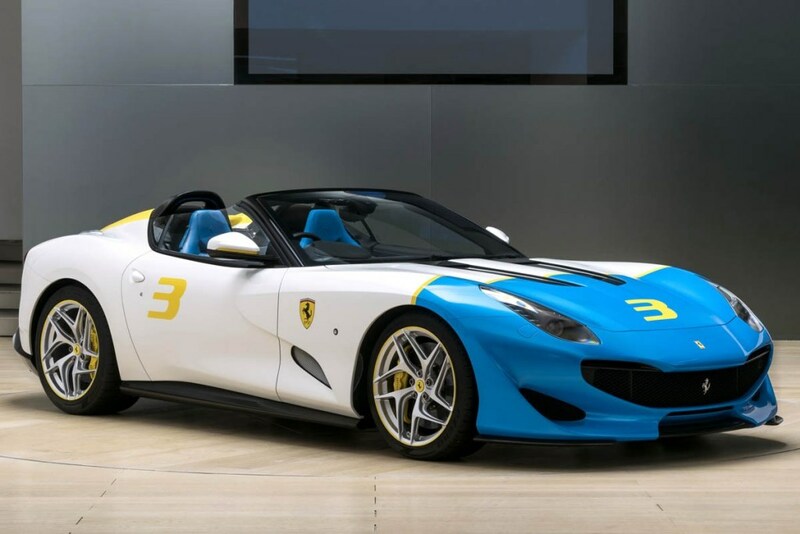 The vehicle designed by the Ferrari Styling Center is an order from a Ferrari collector who wants a pure roadster with a chassis and engine taken from the F12tdf. This car produced only one unit, and ordered by the one-off series, it will provide the maximum expression of the driving experience with an open-roof car, and at the same time will remind again to the 1950s and 60s V12-engined Ferrari spider car product. 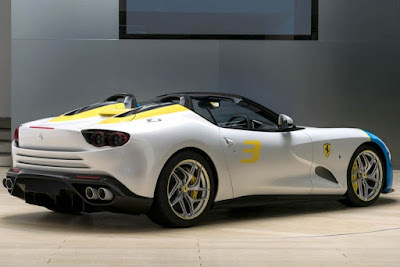 This roofless (obviously) car has a very muscular appearance with dynamic grooves on the sides designed to emphasize the front-engine layout, a typical air intake hole placement on the front, and a dramatic rear fascia with horizontal lines that make it look wider. The client's love of Pop Art is reflected in the firm graphics, and the unique combination of livery from the Azzurro Met (blue) and Giallo Modena (yellow) above the main Bianco Italia (white) color scheme that confirms the sensual impression of the car. 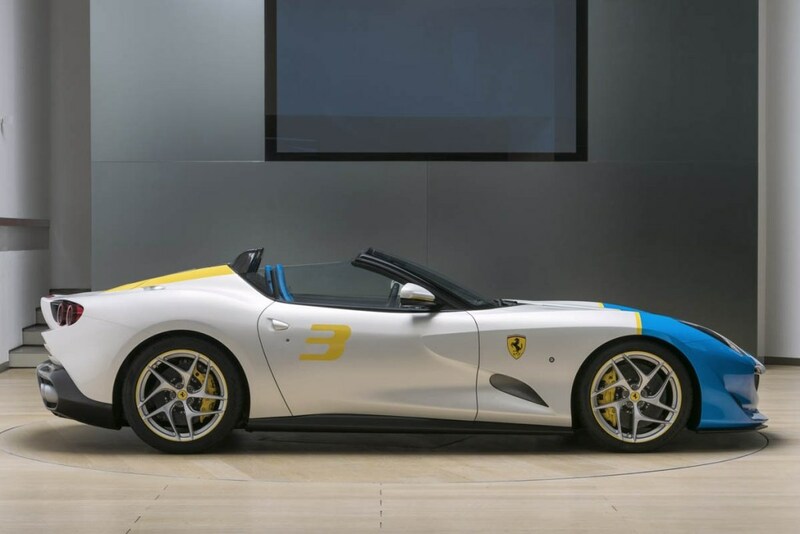 The sporty theme that is strengthened is seen by the installation of special details such as two-glass inserts on the hood to show off the V12 780cv engine, a link between the fairing of an integrated carbon fiber roll and a brushed aluminum fuel tank cap. 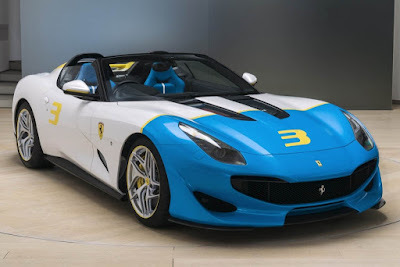 Then on its interior, there is a pair of racing-styled seat made of genuine leather in blue with white inserts. The blue colored leather extends to the bottom of dashboard and is sewn with contrasting colored stitches throughout the interior trim.